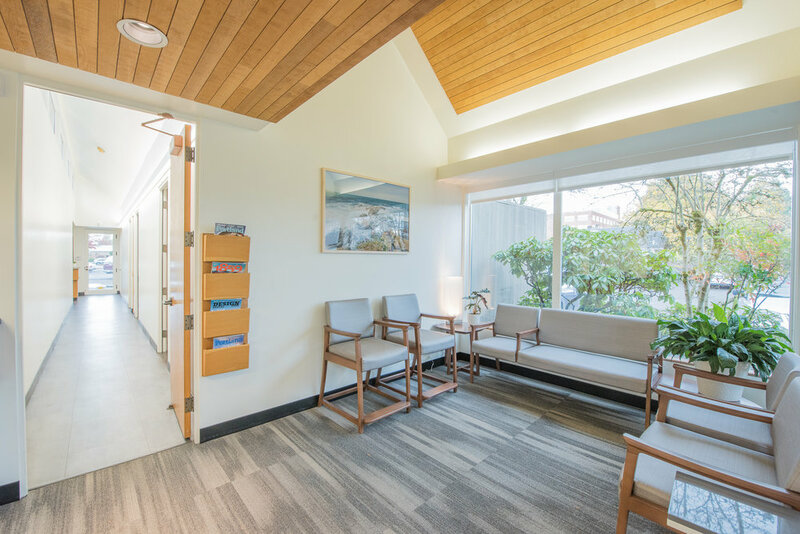 When Dr. Shawn Macalester decided to open Oregon Rheumatology, he engaged S. Baird Design to help him develop his brand and create a new kind of outpatient clinic. Here, patients receive a more personal and progressive care experience, one that focuses on whole patient health to manage their rheumatic condition. Built in the 1970s as part of a medical fourplex, this street-level clinic space had great bones, but the interior was in desperate need of updating. S. Baird's design team played off the loft-like atmosphere and imbued it with a boutique hospitality feel. Exposed white-painted ceilings in the public areas create a sense of spaciousness. Original wood cabinetry, ceilings, and doors, combined with new brushed stainless counters, soffit lighting, flooring, era-influenced furniture and art come together to offer a comforting atmosphere with references to nature. 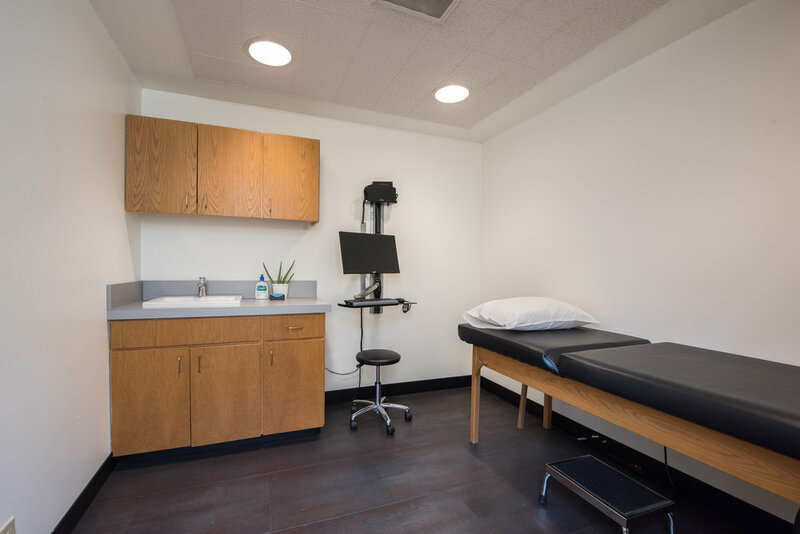 The clinic houses a dedicated infusion center, with a mix of offices, exam and treatment rooms, and nurses' stations for support staff members. The Film Exchange originally housed the local offices of Paramount Pictures, Warner Bros, Fox, and other studios in the 1930s. S. Baird Design worked with developers to transform this long-neglected Spanish Colonial commercial structure back to its former glory. Our team was responsible for the exterior design and updating of the building, which has been repurposed for creative office and retail. The historically appropriate colors, roof tile, and window package harmoniously pairs with the newer modern design of the courtyard, signage, and exterior hardware. S. Baird Design worked in partnership with landscape architects LandLine Design to complete the exterior package. Perched on a hillside with stunning views and wild surroundings, this pair of townhomes is the template for a planned set of four. All interior finishes were a collaboration between S Baird Design and the builder and developer; having worked on past projects together, the process of selecting options was smooth and seamless. Both the interior finishes and exterior colors were chosen to harmonize with the natural landscape. White walls with black window frames create the feeling of being inside an art gallery, with the views of the outdoors acting as large framed landscapes. Wood flooring and doors with knots, burls and woodgrain are evocative of the woodland setting. An exposed wood beam in the living room was purposefully left unfinished to mimic the long span of a tree branch. Attached townhomes in White Salmon, Washington. Black Forest Green and Tate Olive by Benjamin Moore were chosen to reflect the natural surroundings. An old space may have many lives. Originally a neighborhood grocery, this neglected building was purchased by our client after having been used as an upholstery workshop for more than 20 years. Located in a thriving neighborhood, it was acquired with the intent to restore and remodel it into a vintage poster restoration studio, as well as a venue for hosting music events, cooking classes, art openings, and curated dinners. The space was transformed into an open canvas by first removing the interior partitioning and drop ceiling, and then adding skylights and considered layered lighting. It is now filled with natural light, abundant storage, and a new full bath and kitchen. Nestled at the base of Mt. 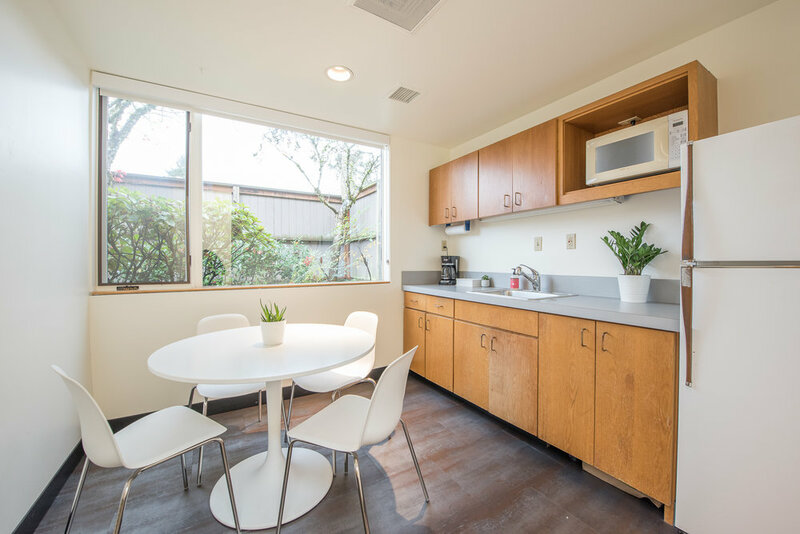 Tabor in Southeast Portland, the community of 50th + Lincoln is the result of a multi-year undertaking between two friends, a realtor and contractor, who decided to invest together and create a high-end rental community in their own neighborhood. S. Baird Design was approached from the initial inception of the project and was integral to all aspects, from exterior design to interiors to branding. Making certain that each unit felt like a space they would be proud to live in, the team helped to create an inspired, vibrant, and tasteful community of 18 rental urban townhomes. Located on the beach in Neskowin, Oregon, The Breakers is a townhouse development that is mixture of vacation rentals and personal homes. Our team was contacted to help one family in this community transform their townhouse to feel more approachable as a vacation rental. Assessing which items could remain and which could be modified, S. Baird Design developed a program of small renovations coupled with updated furnishings and fixtures to give the outdated space new life and a more welcoming feel.